Entertainment Earth Convention Exclusive! 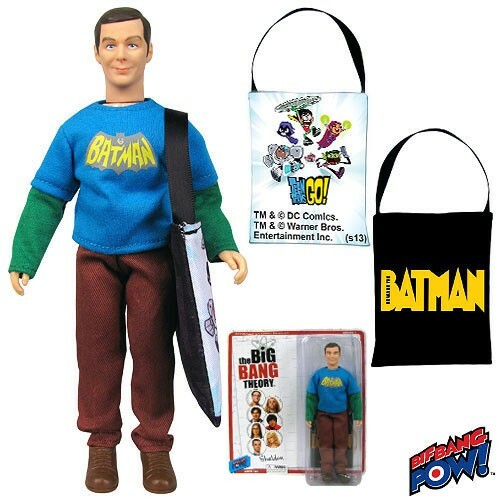 Launching Bif Bang Pow's line of The Big Bang Theory action figures comes Sheldon - that fan-favorite fussy physicist from CBS' sitcom. Sheldon is here to annoy and entertain you. In a retro style that harkens back to the bestselling "Mego" action figures of the 1970s and 1980s, Sheldon Cooper features multiple points of articulation and stands about 8-inches tall in series-true fabric clothing that includes a vintage Batman shirt. He also comes with a cool San Diego Comic-Con style bag accessory that highlights DC Characters Teen Titans on one side and Batman on the other! The bag accessory is a unique limited edition for Sheldon. OK, you can shout out "Bazinga!" now.